Conceptual interdisciplinary artist, Agnieszka Kurant explores how complex social, economic and cultural systems can operate in ways that confuse distinctions between fiction and reality or nature and culture. She investigates ‘the economy of the invisible’, in which immaterial and imaginary entities, fictions, phantoms and emergent processes influence political and economic systems. Kurant probes the ‘unknown unknowns’ of knowledge and the speculations and exploits of capitalism by integrating elements of science and philosophy, and analysing certain phenomena — collective intelligence, emergence, virtual capital, immaterial and digital labour, evolution of memes, civilisations and social movements, artificial societies, energy circuits and the editing process — as political acts. She explores the hybrid and shifting status of objects in relation to value, aura, authorship, production and circulation. Many of her works emulate nature and behave like living organisms, self-organised complex systems or bachelor machines. 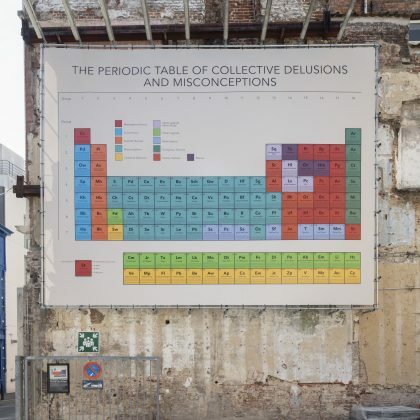 The billboard on the side of Design Museum Gent in Drabstaat is an ongoing project of the Gent graphic design collective 019, providing an alternative exhibition platform for graphic designers. Every design remains in place for 2 months. The 50 sq.m. billboard is all that remains of the exhibition project 019 — Museum Of Moving Practice from 2017, during which the collective temporarily occupied a section of the museum. Billboard is based on the Billboard Series concept on the wall of the 019 building in Dok Noord since September 2015 (a joint project of artlead, All Things Contemporary Vzw & 019). Here you meet Herta, an old lady. This fictional character is for Moriz Oberberger an intimate partner for conversations. Herta brought her daily life actions to perfection. She is the personification of the present. Her life experiences brought her to this point. Herta’s life is unscheduled, although she has absolutely no spare time. Every movement leads simply to the next one. It makes her aware of the essential creature of herself. For the occasion of this billboard, Herta is in the WT building, more specifically in the kitchen. The kitchen is the heart of this school. It is the social meeting point for the first coffee of the day, for communal lunches, discussions and games. It is a space where new ideas occur. This scene is therefore a snapshot of a typical situation during a WT day, where the environment constantly transforms, gives new input for the work and where you occasionally will come across traces of other participants. Moriz Oberberger is an Italian graphic designer and illustrator currently a participant at Werkplaats Typografie (WT), a design school in Arnhem, Netherlands. In his work, Moriz explores the interaction between the insignificance and significance of daily life activities. He focuses on mundane everyday actions, the ordinary objects people use and the settings they are placed in. Subtle observations evolve into a manifold of hidden stories from parallel worlds captured with a playful tone of voice. These narratives are exercised in different mediums, ranging from drawings, stories, books and games. The Werkplaats Typografie (WT), part of the ArtEZ University of the Arts, is a two-year graphic design masters programme founded in 1998. The WT is centred on self-initiated projects and assignments with lectures, encounters, seminars, meetings and readings geared towards self-accountable and independently motivated work and research. Bráulio Amado is a graphic designer and illustrator from Portugal, currently living in New York City. Previously, he worked as a designer at Pentagram NYC and then joined Bloomberg Businessweek as an art director before moving to the New York office of Wieden+Kennedy. Today, he runs his own studio, BAD Studio — Braulio Amado Design Studio. A one-day billboard by Bieke Criel. The design of Experimental Jetset (a graphic design collective, Amsterdam, NL) refers to public instructions in an urban setting, such as city maps, floor plans, charts, road signs, etc. The graphic representation of the location also serves to indicate time, creating a map of time and space. The design is also based on an existing diagram, taken from a book called The Nature of the Physical World (1927). While this project looks very functional, it is also quite mysterious. As a graphic designer, Ine Meganck is fascinated by ghost families who often return within advertising. She collects, analyses and tries to reveal changes and patterns within these artificial families. For this billboard, Ine presents an enlarged winter advertisement of the brand Tommy Hilfiger. Some characters — the mother and father for example — always return through many years of different campaigns. But the art directors have fewer problems with changing and replacing children and pets throughout the seasons. Although there is a lot of attention spent to produce absurd details such as the paintings in the background. These are custom made to present the family tree as convincing as possible. This again contrasts with the fact that both grandmother, mother and grandchild are portrayed with almost the same youthfulness and style. Ine stripped the family of their literal brand references and had the image painted on canvas, in this case by a trained Indian paint-on-demand portrait painter. Ending up (again) with a dislocated family portrait that, because of its location and dimensions, seeks duality again with the world of advertising. British artist and designer Daniel Eatock, known for astute observations and obsessive collecting, creates works which whimsically celebrate the mundane and question accepted convention. By capturing auto repairs where a part is substituted by one from another vehicle of the same model but of a different colour, Eatock’s photographs focus on a practice in plain sight, on economic and transparent fixes. Recognising a connection with art conservation — where repairs are meant to be visible rather than camouflaged — as well as with the Japanese art form of kintsugi, where pottery repairs are illuminated rather than hidden, Eatock elevates a thrifty practice to a place where it can be considered and appreciated as an aesthetic choice. Are these repaired vehicles richer, more valuable and better as a result of accident and repair? Robots of the world! The power of man has fallen! A new world has arisen: the Rule of Jobot und Robot! Entrance on the right. The windows on the front wall look out on the rows of factory chimneys. On the left more managing departments. JOBOT is sitting in the revolving chair at a large American writing table. On the left-hand wall large maps showing steamship and railroad routes. On the righthand wall are fastened printed placards. (JOBOT UND ROBOT’s Cheapest Labor etc.) In contrast to these wall fittings, the floor is covered with a splendid Turkish carpet, a sofa, leather armchair, and filing cabinets. At a desk near the windows ROBOT is typing letters. A billboard by Michiel De Cleene as part of his project Reference Guide. A billboard by Lydia Debeer as part of the eponymous exhibition. A billboard by Karel Martens as part of his exhibition Motion. A billboard by Moritz Küng as part of the eponymous exhibition.